A wedding announcement is a couple’s public declaration of love for each other, and after a while, the marriage progresses into an anticipating moment as the couple announces the coming of their first baby. What better way to celebrate the coming of new life than to tell your family and all the people that matter to you through a baby announcement card? 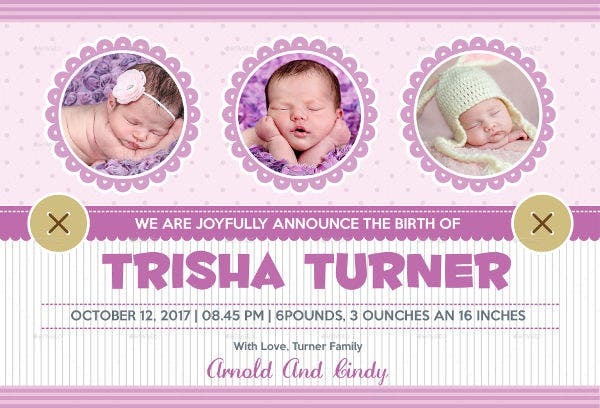 Our baby announcement card templates will make your whole family rejoice because there will be a new addition to your family tree. Select from our elegant and heartwarming designs below. 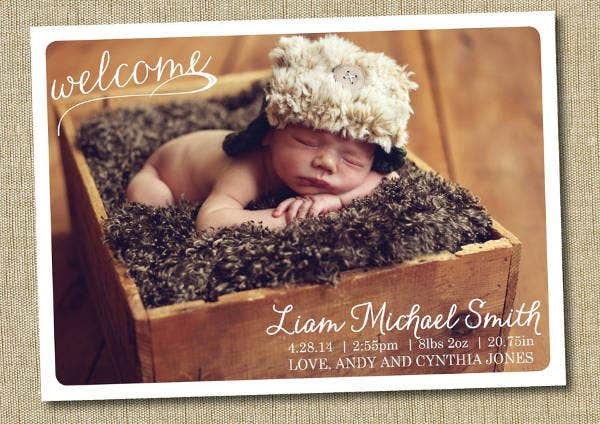 It has sample photos, which you can replace with your own baby’s images or even your first photo as parents. Minimal Baby Announcement Card. 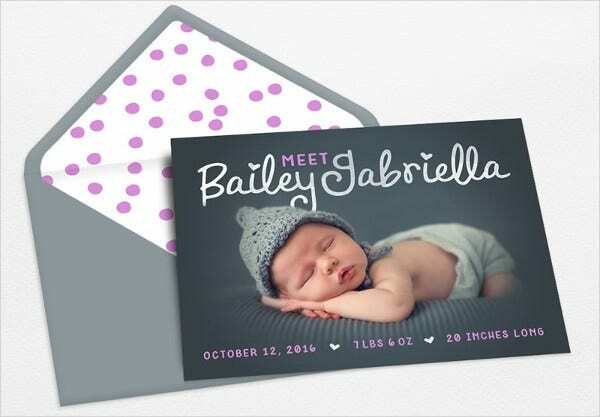 This minimalist design includes a modern border with space where you can add your own baby’s photo; it also has polka dots on the back portion of the card. 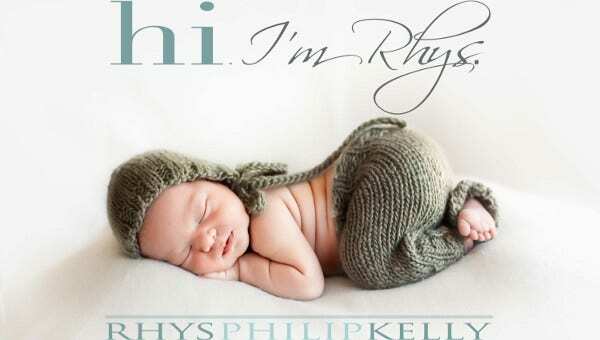 Newborn Baby Announcement Card. Show off your baby’s cuteness with this template that allows you to place three different images of your baby or one close-up view of your baby with a short greeting below it. Baby Boy Announcement PSD Template. First boy in your family? Pick out this masculine design with a millennial style, and feel free to add more photos of him on this template too. Baby Announcement Envelope Template. Want a matching envelope to go with your card? Check out this template with purple polka dots and a gray background, perfect for handing out to your relatives. Classic Baby Announcement Template. Want a fancy looking Baby Shower Invitation? Check out this lavender template with vector lace design that frames your baby’s photos very neatly. Custom Baby Announcement Template. 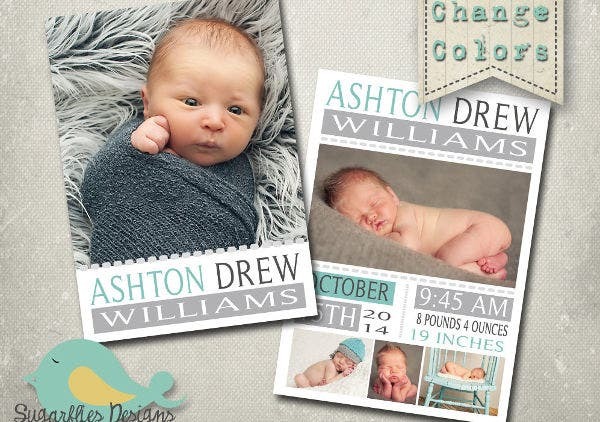 This traditional and simple design template lets you add a full length photo of your baby. Baby Announcement Stationary Card. A fan of stationery? You’ll have fun customizing using this template. Photo Birth Announcement Card Design. Baby just came out of the hospital? You can customize this template in just minutes. Printable Baby Announcement Template. If you want to go for something simpler like adding a photo of your baby, this template will make an instant baby announcement invitation. 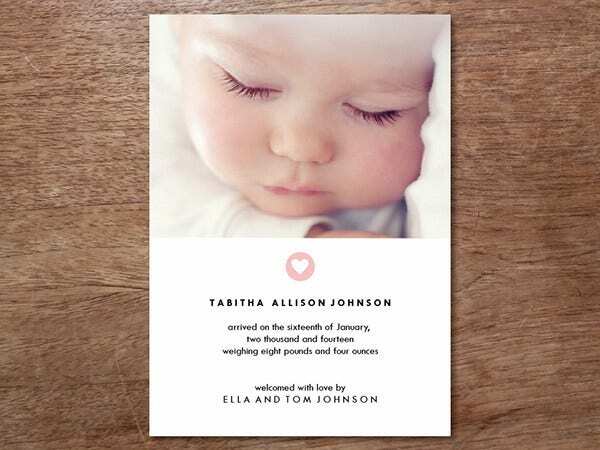 Our baby announcement cards make an effective RSVP tool too, and you can post them as social media invites or even print and give them personally to your guests. Ensure that your photos are of high quality. HDR photos on iPhones will do, or you could even hire a photographer to do the job for you. It’s your baby; he or she deserves to look his or her best. 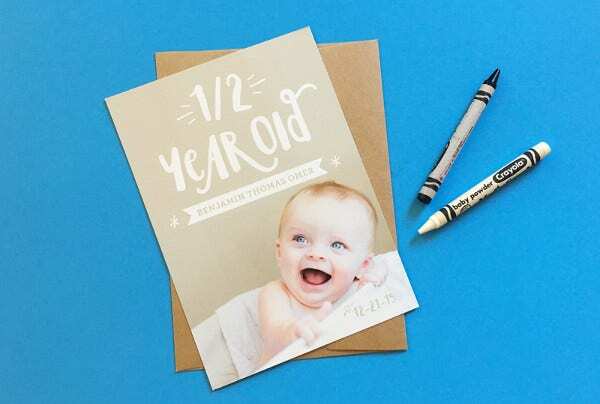 If you’re going to print out an invitation, might as well take a snapshot of your baby using a DSLR camera so you won’t have problems with image resolutions later on. Keep your messages short and simple—that’s the KISS rule. 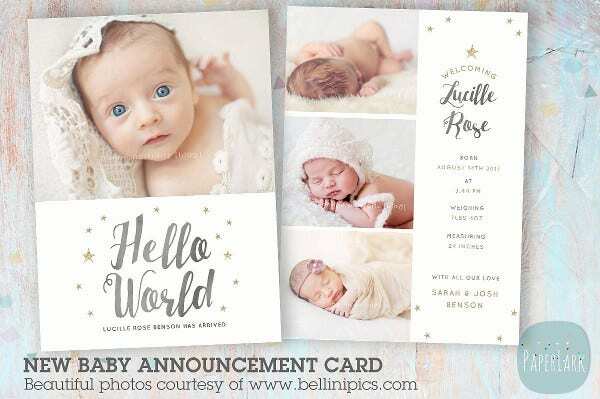 You can start with a message that heartily welcomes the baby to encourage your guests to partake in the event. 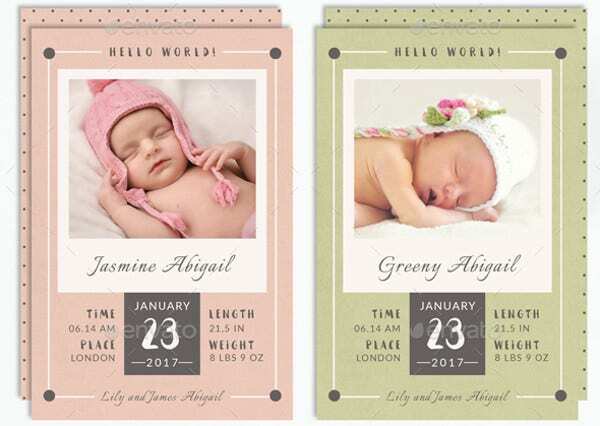 Important details should be made clear on your card cover like where the child was born, the exact date, and, of course, his or her name. You can also add minor details about the baby like the weight and height or add your names as parents of the baby. 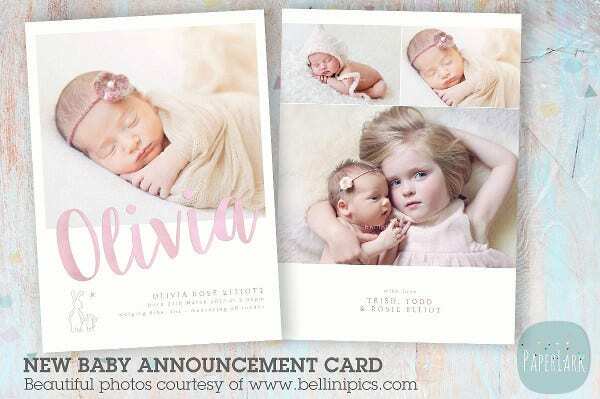 Keep these tips in mind, and you’ll have a seamless baby shower invitation or baby announcement card.